The award-winning Sainath, who specialises in rural affairs and has spent most of the last 20 years in the Indian countryside, now says the burden on rural women has been getting steadily worse in recent years, with many now reaching breaking point. India’s livestock census offers more evidence of this. Women have traditionally cared for small livestock such as sheep and goats, but the added burden of looking after crops means they have less time for this, so numbers are falling. 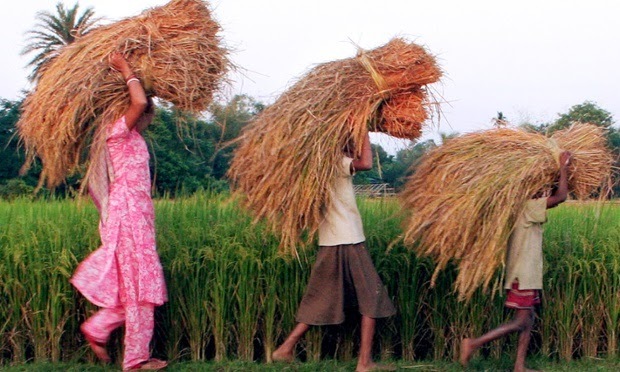 Female farmers’ lack of land titles – custom, rather than law – exacerbates the problem. The rise of “special economic zones”, typically allocated to attract foreign direct investment, has led to farmer displacement. Without their names on deeds, women have been most vulnerable to displacement and suffer more from its impacts, says Sainath. Perhaps the greatest benefit of sangha krishi, according to Sainath, is something that cannot really be measured: solidarity. Amid all the talk of productivity and access to resources, the isolation of smallholder farmers is easily overlooked. Kerala has a history of social movements, and a left-of-centre culture. But there’s no reason why similar change couldn’t happen all over India. “It can happen in the rest of the country. I haven’t the slightest doubt,” says Sainath, adding that this collectivisation is preferable to “the ridiculous farce of public-private partnerships”.